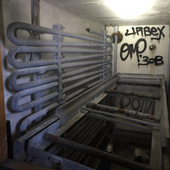 Okay, really it was a full hospital, but the morgue room was a first for my Urban Ex adventures – as I’ve covered hospitals before. Still no ghost though. Interestingly, I did find a a graffiti piece from a Bay Area artist in one of the rooms.